KANSAS CITY, Mo. — Freshman athletes are competing at a higher level than ever before. 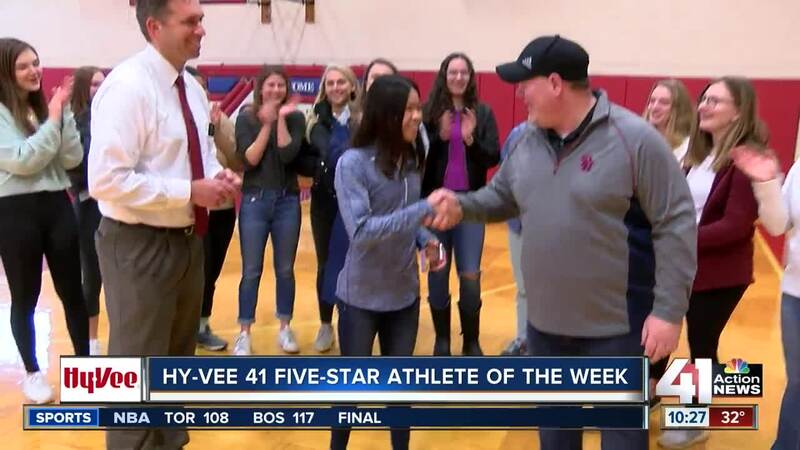 That's certainly evident in the uptick of Hy-Vee 41 Five-Star Athlete of the Week winners that have been underclassmen this year. You can add to the list Pembroke Hill freshman swimmer Audrey Lambert. She recently broke the school's 29-year-old record in the 100 yard breaststroke (1:07.84) during the CoMo Invitational swim meet in Columbia, Mo. The record was previously held by Ursula Miller which was set in 1990. Miller also won the 100 yard breaststroke state championship for Missouri that year. Additionally, Lambert broke a 5-year-old school record in the 200 yard individual medley (2:15.63) which she eclipsed by nearly four seconds. Audrey currently ranks #1 in Missouri class 1 in the 100 yard breaststroke as well as being ranked in the top-5, in the state, in both the 200 yard IM and the 50 yard freestyle. While most would attribute their early success to their own efforts, Audrey credits those around her for her success. "It's really exciting again. I'm just happy my hard work is paying off. It's really great to have a supportive team. It really helps. [My coach] is really supportive. And, it's great to have that support," Lambert said. Chad Holmes has been the Pembroke Hill boys & girls swimming coach for six years. He said that Audrey is certainly near the top when it comes to all of the various swimmers that he has coached. And, he had some high praises for Lambert both in and out of the water. "As a coach, you always get the opportunity to coach athletes with special talents. Her talents are something that, in a lifetime of coaching, I haven't seen," Holmes said. "I have the opportunity to work with her. And, to see her accomplish the things that she's accomplished already so far, it's pretty impressive." Audrey says that she has been a swimmer since she was 8 years old. However, she's only swam competitively the last four years. Her future certainly seems bright. And, she even says that she would enjoy the opportunity to swim in college after high school. "Yeah, that's my plan [to swim in college]," Lambert said.